Drive the speed limit. The speed limit is set to allow for safe driving speeds and to allow enough time to stop when needed. Obey all traffic signs and signals. They’re placed at designated locations to improve safety for drivers, pedestrians, and bicyclists. But, they are only effective if you respect them. Observe the right of way of other drivers, pedestrians, and cyclists. Stop for pedestrians crossing the street, whether they’re in a crosswalk or at an unmarked intersection. Slow down in school zones and neighborhoods. 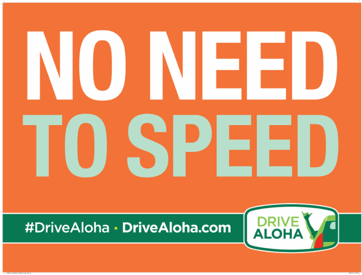 Be especially attentive in areas where keiki may be crossing the street or walking along the roadways.